LightSKIN LED seat post is a must-have for all biking enthusiasts and sure to attract attention in urban traffic. The seat post enables a pure design while still maintaining material strength and function. Compared to common taillights, LightSKIN offers numerous further advantages: Since the lights are completely integrated into the seatpost, they are safe from theft and damage. LightSKIN’s topmost LED functions as a control button for five different light modes. Two AA batteries located inside the seatpost provide up to 400 hours of illumination. To change the batteries, the seatpost is simply removed and new batteries are inserted. Thanks to its patented interior structure and a silicone-coating, LightSkin seatpost is completely weatherproof. There is simply no better (and more stylish) way to show your taillights to local SUV’s and law enforcement alike. 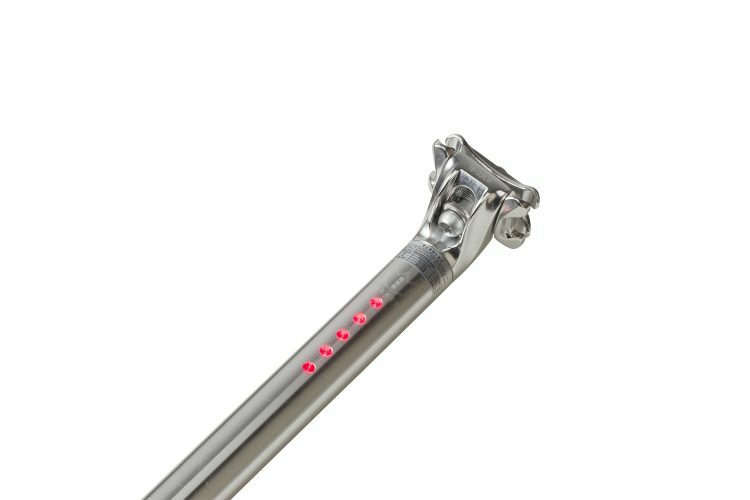 The Lightskin Led Seatpost has won the Reddot design award in 2010 and is available in Chrome only.